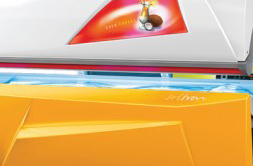 The BEAUTY ANGEL CVT 42 is multi-talented in either a tanning salon or a fitness studio. 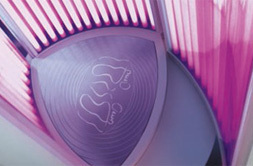 The combination of a light shower and the patented Vibra Shape training delivers a combination of results. The side-alternating vibrations help with weight loss, firm the body and intensify the effect of the light. For a younger appearance and a noticeably better feeling in your whole body. 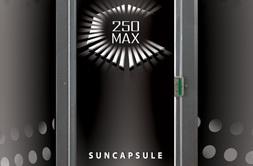 Connective tissue cells are stimulated by 42 high-performance Beauty Light lamps to produce collagen, elastin and hyaluron quite naturally. 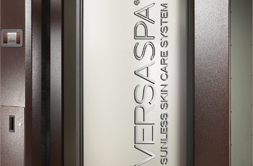 Small wrinkles are reduced and the skin becomes visibly tauter and smoother. Improved cell production also increases the muscles' ability to regenerate. The results of photo bio stimulation (stimulation of the body using light) are complemented by the fitness training given by the vibration plate. Thanks to Vibra Shape the BEAUTY ANGEL CVT 42 offers not just an innovative light treatment, but also a healthy training effect. The patented seesawing function simulates normal walking, which means the patented vibration plate is a 100% physiological training method. It trains all of the muscles from the legs up into the abdomen and back. At the same time weight loss is encouraged by increased calorie consumption, and cellulite can be prevented thanks to the tightening of the connective tissue. The improved circulation also has a positive effect on the photo-rejuvenation results. Regardless of whether you are young or old: the four individual Vibra Shape programmes will help you to achieve your goal quickly. In the total privacy of an enclosed booth, naturally. What's more: combining training with collagen generation is a method for protecting joints that is highly recommended, even for athletes. No matter which training programme you select: the 3D-sound with its iPod dock will increase your motivation when training by helping you enjoy your own music. The high-performance ventilation makes sure that even in the heat of summer you have ideal training conditions. click here for the best ways to prepare. MAKE IT LAST... click here for ways to enhance and extend your tan. 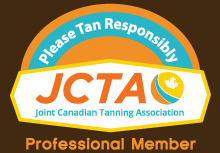 FAQ... click here for the answers about sunless tanning.